Expand the Operations Division menu on Quicklinks. Click Hydrant/System Reports and bypass the county pop-up warning or wait for it to close automatically. Click the Settings Gear icon in the upper-right corner (or press Alt-T on your keyboard to access the Tools menu in Internet Explorer). Choose Compatibility View Settings from the list. Note that frsdata13 should appear in the top box; this is the name of the report server. Click the Add button. 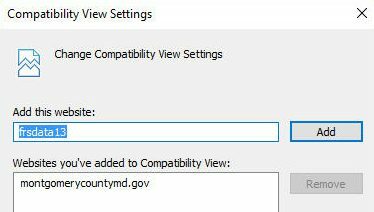 The name of the report server should move to the lower box, where it will either be alone or join montgomerycountymd.gov, the necessary addition to run MCtime. Click the Close button and the report window should load properly. Wondering where things are in the new Quicklinks menu structure? This TechTip is a guide for you. Search Bar: Unfortunately, this search bar is not limited to Quicklinks. If you are going to run a search to find what you need, precede whatever keyword with Quicklinks (e.g., Quicklinks Safety) in order to narrow your search to the Quicklinks site. Top Row Links: These are a handful of the most commonly accessed links so you won’t need the expandable menus at all to access email, MCtime, etc. Expandable Menus: The 10 menus provide links in an organized manner. Fire Chief: FCGOs, IBs, Policies and Procedures, etc. Most Common Quicklinks: While some of these items are also on the top row links, the list is slightly longer here. Find the most accessed links conveniently in this one place. Current Top-Priority Projects: What’s most important at the moment? What training is required for all personnel at the moment (e.g., Annual Recerts)? Find the links here. The list will change as department needs change. Department Websites: Can’t remember the address for the main public website? How about the public information (SION) website? Webstaff? Tech Training? Find those and more here. Videos and Department Misc. : Looking for the latest fire chief’s video? Operations Division: From management tools (DOC Log, Apparatus Tracker, etc.) to links for the Operations sections, Roster/Transfer Info (Battalion Roster, station vacancy page, etc.) and the station commanders’ reference guide, your Operations links needs are generally met here. Volunteer & Community Services Division: The DOVS QL homepage is here, a wealth of information and links for volunteers. As the division contains Community Outreach, public education links are now here. Support Services Division: Need to find basic information on the Logistics section? How about the Tech Training Blog for an archive of TechTips? Here is where you need to be. Fiscal Management Division: Find the expense voucher, mileage reimbursement form and more. If it pertains to money, this is a good place to start. Interested in making Firefox your default browser and moving away from Internet Explorer? Here are some basic instructions. Click the Firefox menu button at the top-right corner of the browser. Note the first line in the options: Firefox is not your default browser. Locate and click the button to the right of that statement labeled Make Default. Interested in making Chrome your default browser and moving away from Internet Explorer? Here are some basic instructions. Click the Chrome menu button at the top-right corner of the browser. Find and click the button labeled Make Google Chrome the default browser at the bottom of the program options.